Next time you are in Seoul, pay a visit to the heart of the city. Take a gander at Dongdaemun Gate, and tumble onto Jongno 5-ga, where you will stumble across the vibrant Gwangjang Market filled with merchants welcoming regulars, hagglers seeking to put a little more into their bags, and the pungent smell of a mixture of dishes floating in the air. Enter the South 1st Gate into the food zone, and you will find stalls with colorful delicacies on display. Among them is a store famous for side dishes, Honglim, which has been selling quality jeotgal for the past six decades in the same spot. Jeotgal refers to salt-fermented seafood and uses a wide range of seafood as ingredients. But it’s not just salty, mashed-up fish we are talking about: a variety of spices can be added to complete this beloved side dish that is affectionately referred to as “rice thief” -- meaning it is so good, that one keeps eating more rice to go with jeotgal. While jeotgal today is made predominantly using seafood, jeotgal made from meat was common in ancient times. The records show hae was among the favorite dishes of Confucius. The great mind, however, laid off the dish after his disciple and close friend Zhong You was killed, and his flesh was sent to him in the form of jeotgal. In an odd twist, this tragedy transformed over the years into a far-fetched and completely false rumor that Confucius practiced cannibalism, deriving from the fact that both the Chinese characters for hae and the punishment for turning a person into jeotgal are identical. In Korea, the oldest record of jeotgal appears in “Samguk Sagi,” or “History of the Three Kingdoms,” when it was used in a feast for a royal marriage held in the Silla Kingdom in 683 AD. Of course, the country’s neighbors of Goguryeo and Baekje are also said to have enjoyed the fermented dish, with Baekje people making jeotgal with even the poisonous blowfish. The official website of the Ministry of Culture, Sports and Tourism states that jeotgal in Korea is believed by scholars to go all the way back to the Neolithic Age. While its exact origin is hard to determine, it is an everyday dish. Ingredients used for jeotgal consist mostly of seafood, from shrimp and octopus to oysters and shellfish. The marketplace is not the only place to find jeotgal. In the past months, a number of regions famous for the delicacy have held jeotgal-themed festivals. Buan-gun, North Jeolla Province, held the annual Gomso Jeotgal Festival in September for visitors to enjoy jeotgal produced in the county. The Nonsan Ganggyeong Jeotgal (salted seafood) Festival in Nonsan, North Chungcheong Province, is one of the biggest annual jeotgal-themed festivals in Korea. It was held from Oct. 10-14. Organizers say that jeotgal produced at Ganggyeong port accounts for roughly 60 percent of jeotgal sales across the country. Due to Koreans’ centurieslong love affair with jeotgal, one can easily come across a seaside city boasting jeotgal as its delicacy. This includes the jeotgal market in Oipo-ri, Incheon, and galchisok-jeot, jaridom-jeot and myeolchi-jeol -- made of cutlassfish, saddleback clownfish and anchovy, respectively -- among many jeot produced on Jeju Island. Jeotgal is also an ingredient in many of Koreans’ favorite side dishes, such as kimchi. While it is a tasty delicacy, studies suggest that one should refrain from eating too much of the dish that is covered in salt and spice. A recent report by the Korea Consumer Agency showed 305 cases of illnesses caused by fermented crab and jeotgal were reported between 2015 and June this year. The study also found colon bacillus in a jeotgal product sold by a major retailer. Due to the strong flavor, it is difficult for consumers to realize that jeotgal has gone bad. In addition, the sheer amount of salt used can have a negative impact on one’s health. 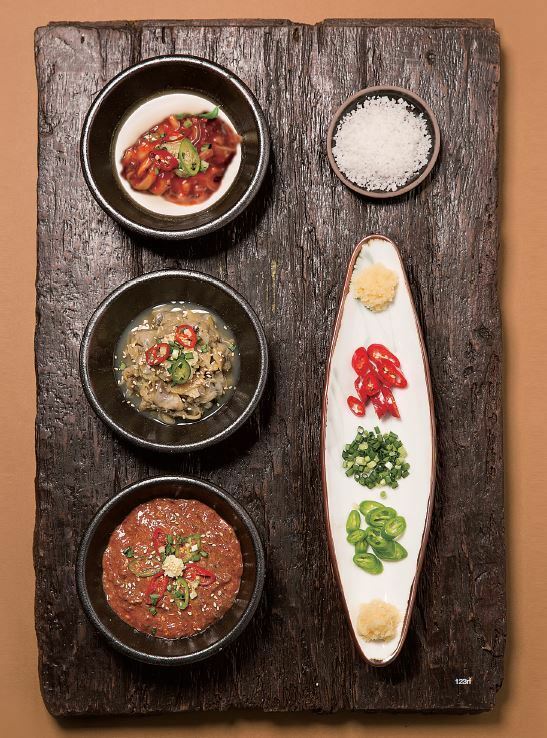 Although it may not be particularly healthy, jeotgal’s flavor and variety continue to make it a welcomed dish on the dinner table in Korean households.